It looks like we can add hyenas to the list of animals that can count. In fact, hyenas can count nearly as well as primates, a sure sign that these carnivorous predators are unusually intelligent. This is caused by their sophisticated, hierarchical societies in the wild. 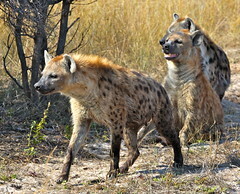 Hyenas are among the few animal species to have unusually-complex social groupings, to the point where scientists consider them "societies" instead of packs. Let's face it, hyena fans: hyenas usually get a bum rap, being called stupid, or "laughing idiots" from their laugh-like barks and calls (some of the blame on this may lie with Ed from The Lion King). However, researchers have repeatedly demonstrated the cognitive abilities of hyenas rival those of monkeys. New research from Michigan State University suggests hyena intelligence evolved as a means for the spotted & striped predators to keep track of their social groups. This is where the ability to count comes in: they responded not just to the number of whoops from 'intruders', but to the number of unique calls. If this sounds familiar, it should, because wolves use their howls in a similar way: to maintain contact with far-flung members of their packs, and to determine any potential intruders into their pack's territory. Despite having an outwardly canine appearance (thanks to convergent evolution, as they occupy a similar position in the food chain), hyenas are actually far closer in genetics to mongooses and felines. The study did not mention if the hyenas were in the process of evolving into gnolls or wereyenas. I love hyenas. This article makes me happy. My fursona used to be a hyena. Hell, I don't think I've ever been anything but an animal from Africa. ._.